A friend of mine, whose blog you can find here, suggested I start posting recipes for Meatless Monday, a phenomenon which seems to have taken hold in foodie circles on Twitter. The idea is that by cutting out meat once a week you will not only improve your health and well being, but you will also reduce your carbon footprint and take a big step towards creating a more sustainable lifestyle for yourself and your family. I think we can all agree that these are good things and there are few things that irritate me more than people who believe that a meal without meat is somehow incomplete − I’m a poet and I don’t know it! − because vegetables have so much more to offer than looking sad and neglected on the side of the plate. I’ve posted vegetarian recipes before, but never on a specific day because I’m not usually organized enough to know what I’m going to cook and when, even though I work under this pretense whenever I go grocery shopping. We actually enjoyed this vegetarian feast on Friday night, but whatever night of the week you decide to jump into bed with vegetables is a good one as far as I’m concerned. The point is that you’re doing it. For those of you who don’t know, I’ve had to move back to California for a short time to reapply for a visa to rejoin my husband in the UK. He has now gone back to England and I’m living in California with my mom and grandma and nearby to my aunt and uncle. We all love food and finding and using local produce is big here in the Bay Area, so I’m hoping for some great recipes to come in the weeks ahead. My grandma and mom get a vegetable box delivered once every two weeks and in it this week were zucchini, spring onions (as in tiny new onions, not green onions) and fennel amongst other things. 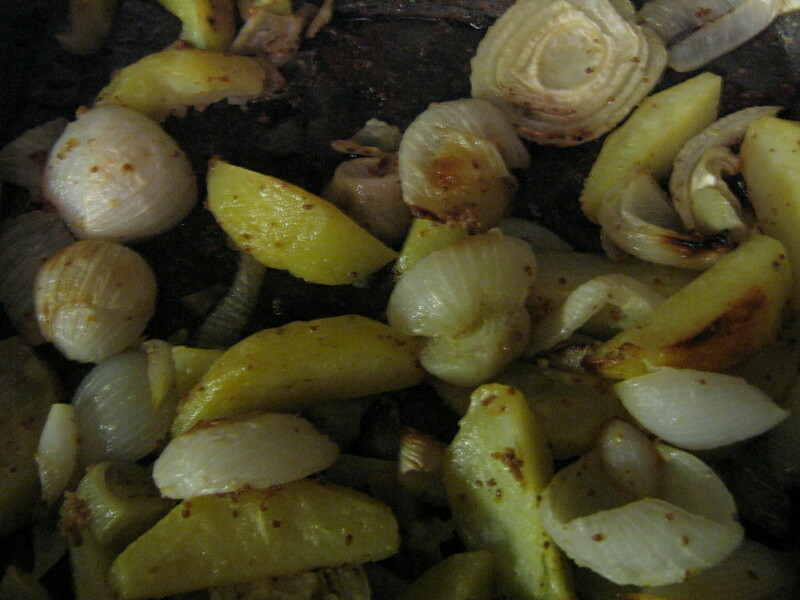 My grandma immediately decided that roasting the fennel with some potatoes and some of the spring onions would be the best thing to do, so she went about chopping all the vegetables in similar size wedges and roasted in a 400º oven for about an hour with some olive oil, whole grain mustard, salt and pepper. The zucchini were my job and as I had just flipped through the latest Martha Stewart magazine, I decided to muddle around one of the recipes I found in there. 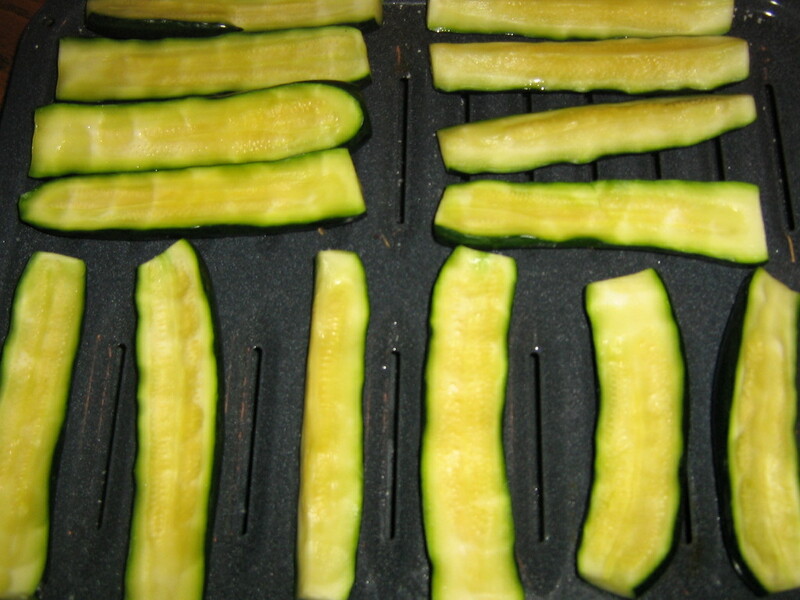 The zucchini were small ones, so we halved them and salted the cut side, then laid them cut side down over a rack for the liquid to drain away for about an hour and a half. After that time, I squeezed them gently to remove as much liquid as I could − you’ll notice the slightly fingered-printed versions post-squeeze. 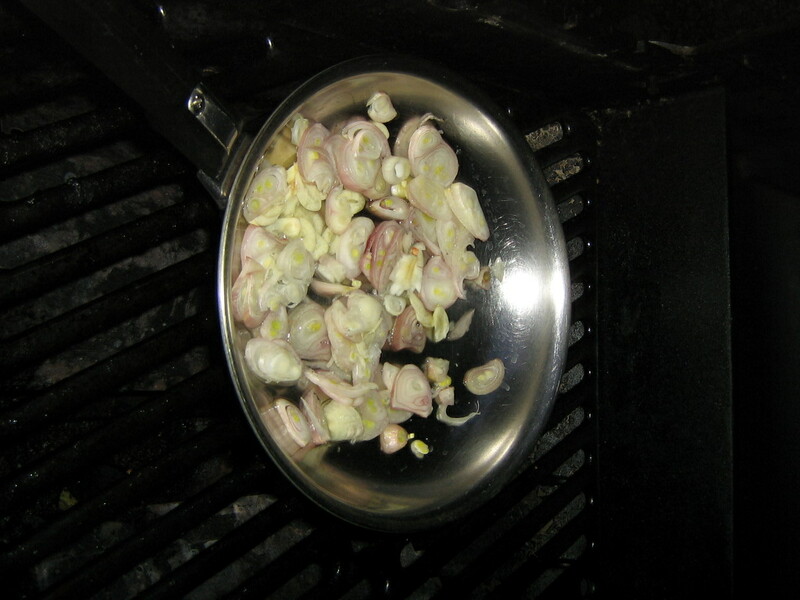 After sprinkling them with a little olive oil, onto the grill they went! The asparagus were oiled, salted and peppered and went on at the same time for approximately 15 minutes, turning halfway through. After 15 minutes both were ready to be removed being slightly charred in places, but still strong enough to (mostly) hold their shape, so I knew they would be crisp tender and perfect. The zucchini then got tossed with a few tablespoons of cider vinegar and left to sit while I cooked some shallots and garlic just until they started to go translucent. These then got spooned over the zucchini and that was all topped with crumbled goat’s cheese. In Martha’s recipe you then put on toasted crushed coriander seeds, cilantro (which I bought but forgot to use!) and huckleberries. Oh, and the cheese she used was slices of feta. In any case, my grandma doesn’t like a lot of faffing around when it comes to cooking, so I adapted the recipe slightly − meaning I didn’t use any of that stuff. 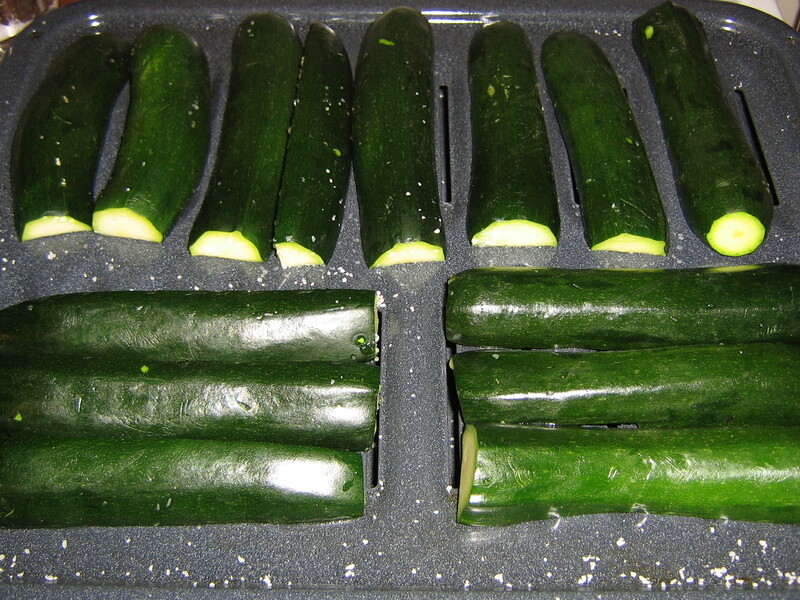 The zucchini are also supposed to marinate in a lot more vinegar and all the spices and herbs for up to 24 hours in the fridge, but we wanted to eat them then, so we did and they were delicious. I think they would be even better marinated overnight and then brought to room temperature, but they were pretty darn tasty as they were, even without the huckleberries. The potatoes and fennel were crusty and caramelized with sweet, juicy chunks of fennel and onion to balance out the fluffy potato. 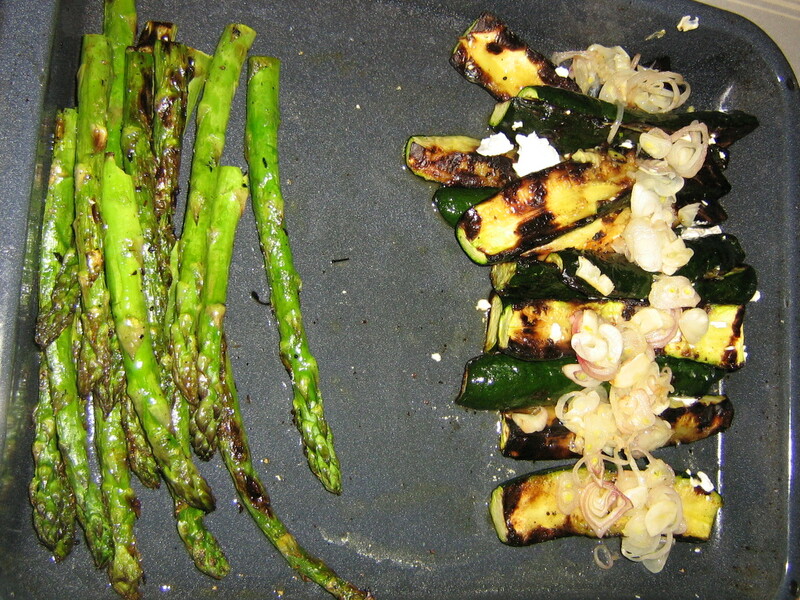 I think asparagus speaks for itself and, for me, simply grilled with salt and pepper is perfect. Some may say that this looks like a dinner of side dishes, and maybe that doesn’t hold water with the whole Meatless Monday mantra, but it tasted darn good and we were all full afterwards, so ultimately I’m going to call it a success. Stay tuned next Monday for a Brazilian-style salad with a slightly unusual, but outrageously healthy ingredient. You won’t believe this salad is good for you! I’m not quite sure, I just pretend to know the lingo over here. I did meatless Mondays as a New Years resolution last year. It wasn’t as hard as I thought it would be. The latest thing is Vegan before 6. It’s where u eat vegan before 6p everyday. I’m not touching that because I more than occasionally NEED a big ol BLT for lunch. Yeah, that sounds like a little too much. I like butter. On everything. Trying Meatless Monday myself. I give myself a week…. 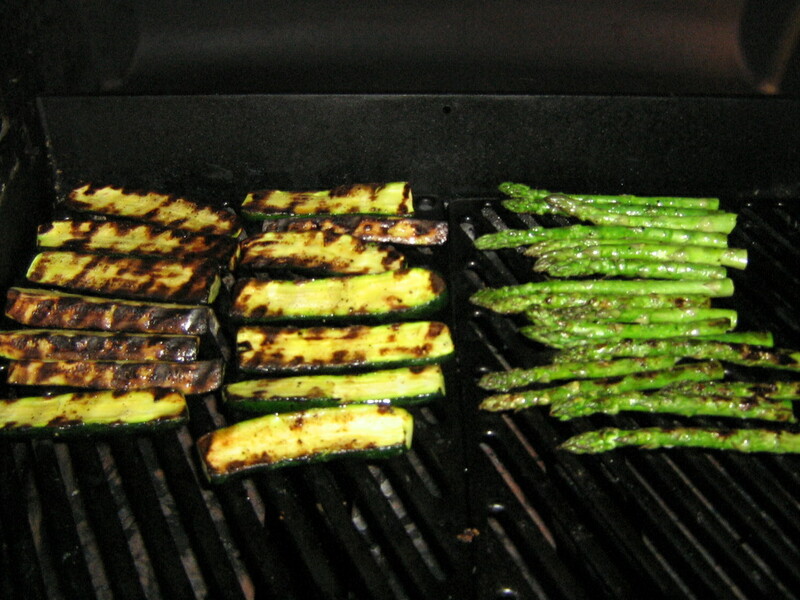 Grilled asparagus is the best. 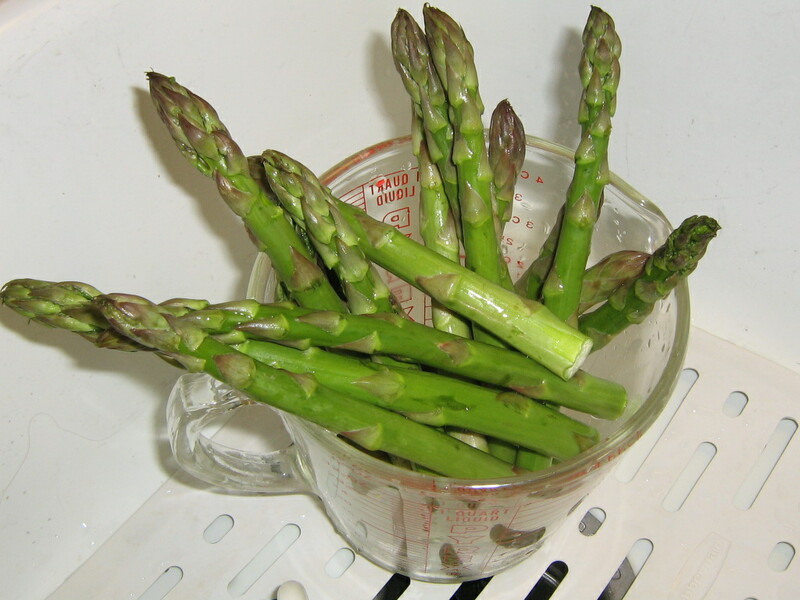 Asparagus spears are great roasted with a little olive oil, sea salt and black pepper, and served with a poached egg and some cheese. Quick, simple and delicious.